Days of Our Lives Recap: Where is the Real Nicole Walker? Nicole Walker has been one of my favorite characters since she tried being a church secretary for Eric. The Nicole I knew then was smart, confident, and willing to be devious for a good cause. She loved Eric but wasn't afraid to stand up to him when he left her in limbo because the church wouldn't sanction their marriage. She kept JJ's secret about the night Theresa overdosed but expressed her concerns to Daniel. She ignored Daniel's attempt to protect her and helped fight off a drug dealer he'd decided to confront, then blackmailed the dealer into leaving town. 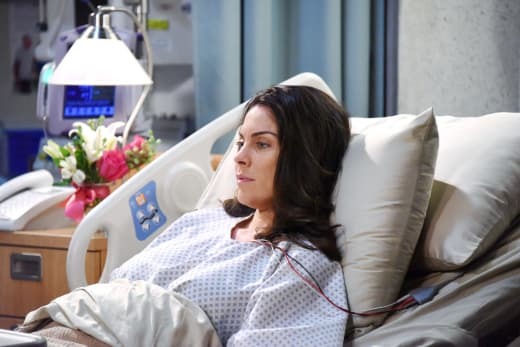 That Nicole is long gone, and instead we have this weak woman who loves Deimos for no apparent reason and is willing to beg both him and Brady for permission to visit Chloe in the hospital. Nicole's character has been on a downward trajectory for a couple of years. After she shredded some documents that Eric claimed not to care about, then judged her for endlessly, she traded in her martinis and sardonic sense of humor for endless begging that he take her back. That was bad enough, but this latest iteration of Nicole is insufferable. Since meeting Deimos, Nicole has been accused of murdering him, ordered not to see her best friend, and warned by everyone in town that he's bad news. He ruined her relationship with Chloe by refusing to allow her to see Chloe alone and Nicole walked in on him, this week, while he was yelling and making death threats against Andre. None of this opened her eyes, however, because Nicole is no longer written as an intelligent, street-savvy woman. Instead, Nicole made a bunch of excuses for Deimos' behavior and insisted he was really a good guy after all. Chloe: I can't believe you're making excuses for him. If you marry him, you'll be doing that for the rest of your life. Chloe: I'm sorry. I just don't know how you could go from Daniel to a man like Deimos. Nicole: I've tried to explain. Chloe: I know. He brought you back, he showed you you could love again. Oh my God, Nicole, if you'd just think for a second it would make everything so much easier. Chloe decided not to let Nicole see baby Holly anymore because she sees Nicole as too weak to stand up to Deimos or to ensure that he never sees the baby. The sad thing was that Chloe was right. And it shouldn't be that way because weak has never been a word that describes Nicole Walker. Love has always been Nicole's Achilles heel, but she's never been blind or stupid. She held her own with Victor and EJ, yet seems to need Deimos' permission to make her every move. This diluted version of Nicole has got to go. Everything that made her a unique, interesting character has disappeared and she's become a stereotypical lovesick woman. Meanwhile, Chloe is making the questionable ethical decision to keep Holly's parentage secret so that she can make sure Deimos stays away from Holly. The problem is, the baby is not Chloe's. Chloe carried her, but biologically the baby is Nicole's, and Chloe only ever had access to the embryos as a surrogate. Nobody knew she tried again to conceive a baby after Daniel's death, and I'm not sure of the legalities (not that Salem follows the same laws as the real world anyway). But morally, what Chloe is doing is wrong. Nicole is Holly's mother and she has the right to know that and to make decisions for her child. It's true that Deimos is not exactly a good role model for a child, but that is really not Chloe's decision to make, not unless her surrogacy agreement gave her that right. I wish this storyline had been done while Daniel was alive and that Nicole knew the baby was hers. It would have been a compelling story about surrogacy and if Daniel died after his baby was conceived, the ensuing drama about who raises the baby would have been interesting. Instead, this storyline is weakening both Chloe and Nicole. Chloe is acting in very problematic ways and Nicole has become weak and stupid. Dario: Hey, Nicole. I'm glad I ran into you. Wanna go to the movies? I heard that new comedy is really great. Nicole: Um, well, I kind of already made plans. Dario: With Deimos, right? Nicole, you should stay away from that guy. Nicole: That 'guy' is my fiance. And I wish people would stop saying that to me. Dario: Yeah, well, Deimos is dangerous. And when you're that dangerous, bad things happen. Stay away from Deimos. Meanwhile, there's a competition to see which Hernandez can be the most hypocritical. Rafe castigated Anna for shooting Steve in the arm because she's a crazy woman shooting at innocent people, yet he helped Hope cover up Stefano's murder. To make matters worse, Anna was attempting to kill Stefano when this debacle occurred. Gabi continued to keep her family's secrets while having broken up with JJ because he kept secrets for his family and that made him untrustworthy, especially since knowing the woman who raped him made her feel insecure. But Dario is the worst offender. For months viewers were treated to endless tirades about how horrible Eduardo was because of his career as a hired assassin. Yet Dario's response to this whole conflict over the microchips was to hire a hit man to take care of Deimos. Not only was this extremely hypocritical, but also stupid. Dario already discovered that attempting to shoot Andre wasn't going to work; why did he think violence against Deimos will fare any better? In any event, Dario tried yet again to get Nicole interested in him instead of Deimos and in the course of conversation, mentioned that Deimos was dangerous and Nicole should stay with him at least three times in two minutes. Nicole, using what was left of her brains, realized Dario was making an actual threat. However, instead of letting her friend Rafe know what his little brother was up to, alerting the police via her other friend Roman, or anything else sensible, she decided to go warn Deimos that his life was in danger. Kate broke things off with Eduardo after he accused her of stealing a microchip that was actually stolen by Deimos. This seemed like a really silly reason for a breakup. Kate made a big deal out of how once trust is lost, it can never be rebuilt. You'd think Eduardo cheated on her, the way she was going on about it. All Eduardo did was assume that she stole a microchip that she later admitted she had been hired to steal! This is the kind of weird double standard that I find really annoying. I'm no fan of Eduardo, but making a false accusation of theft and then recanting it is hardly on the top of his list of sins. It reminds me of the way Hope got a free pass for murder but Aiden was persona non grata because he told a lie and for a while Nicole was the town pariah because she shredded some papers. I might have felt sorry for Eduardo if it weren't for his ridiculous, judgmental attitude towards JJ. Eduardo attempted to dissuade JJ from investigating him by accusing him of having cheated on/hurt both his daughters. First of all, in one case JJ was clearly raped and in the other there were circumstances that made his ability to consent questionable. But even if that were not the case, Eduardo attempting to take the moral high ground here is laughable. Eduardo not only murdered people for a living, but also abandoned two families because of his career. He didn't know Paige well enough to even comment on her relationship with JJ, and he missed out on Gabi's entire childhood. Yet he dares judge JJ? Eduardo is a killer and JJ is a cop whose worst sin is breaking a store window while in the midst of a nervous breakdown. I really wish Paige was still alive because unlike Gabi, she was a strong woman who didn't resort to tantrums and verbal abuse to try to get attention, and she most definitely would not have put up with Eduardo putting his nose in her relationship with JJ. Dario: I love how you two are talking about this like the Hernandez family isn't even part of the picture. Dario: Let me tell you something. We may be the new kid on the block. but we're developing the system. Your brother Andre's version was junk. Sonny: Dario, the thing doesn't work for any of us. Permalink: Dario, the thing doesn't work for any of us. Dario and Sonny's argument over the "Orwell" device was an unintentionally funny meta-commentary on the state of the show. 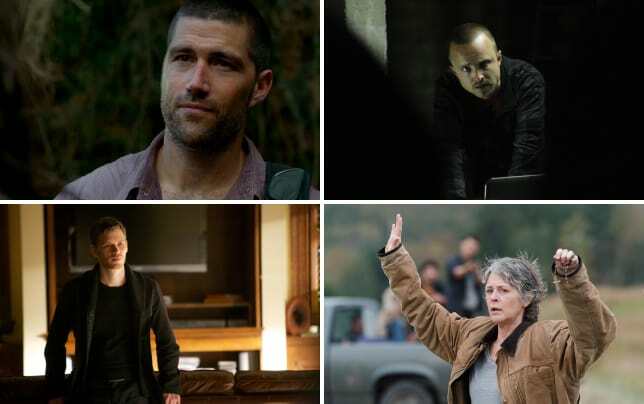 Over the last year or so, the Hernandezes have taken center stage but their characters have not been given redeeming qualities or interesting storylines, so putting them there has done little for anybody. This business war story could be interesting if written properly, but I found my mind wandering during it. First of all, I wasn't invested in these microchips. The story began with Dario hiding something in a purse, which seemed like a rerun of the boring, ridiculous, and pointless elephant story of a few years ago. Dario is one of the least interesting of the newer characters and doesn't do much except for yell at people, so I couldn't care less what he was doing. I've always liked Chad and Sonny's friendship, but neither of them is a ruthless businessman and this conflict between them seemed contrived as a result. Plus, Abigail and Gabi put aside the fact that Gabi was interesting in screwing over Abby's brother in order to steal her husband from her in order to spy on the guys. That just wasn't realistic and their plan to destroy the device before any of the guys can is silly. Finally, Eric returned this week! It was nice to see a version of him that doesn't have his nose quite so high in the air. This more humble Eric is far more likeable, though he is being wasted on this silly Hope storyline and it wasn't believable that he knew how to stitch a stab wound. Eric apparently got out of prison after saving a young girl who wanted to kill herself. The flashback scenes were interesting, but I couldn't help thinking that the girl looked like a young Kristen and that that must have tormented Eric. Is anyone else missing the real Nicole Walker? Is the microchip story holding your interest? Weigh in below, and don't forget to check back on Sunday for the Days of Our Lives Round Table discussion!